Enjoy this direct ocean sunset view from our private terrace. 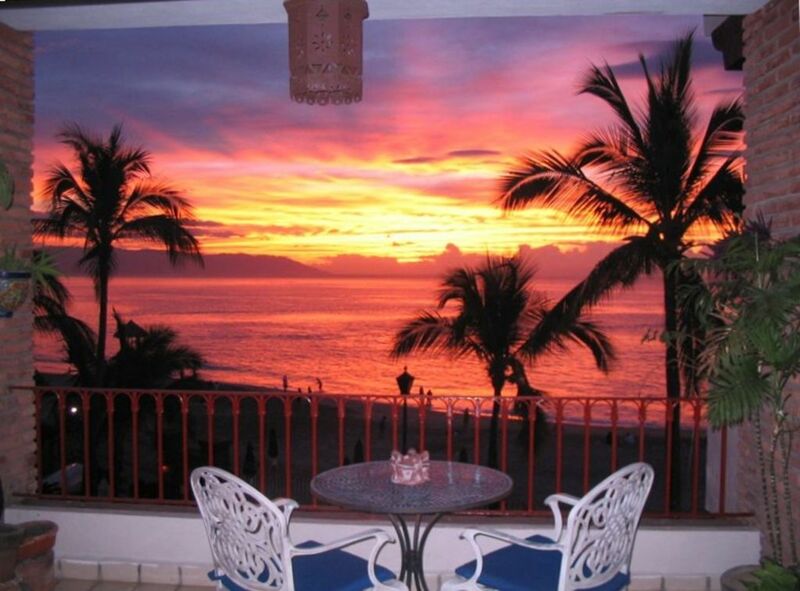 This one bedroom rental condo is RIGHT on Los Muertos Beach, the best beach in Puerto Vallarta. Outside the front door is the best neighborhood in the beautiful Romantic Zone with quaint Mexican buildings along cobblestone streets, outdoor cafes, many of the best restaurants in the area and also mom & pop very inexpensive little restaurants with local food, internet cafes, groceries, tour agencies, car rental agencies, nightclubs as well as palm-roofed beach shacks selling food and drinks, galleries, and fashionable shops as well as outdoor stalls with locals selling their wares. We are also right next to a beautiful authentic Mexican plaza. Out the back door, past the ocean-front swimming pool surrounded by lounges, tables and deck chairs, is our building's private area on one of the widest and less crowded parts of Los Muertos Beach. Don't be fooled, because most of the other listings in the Puerto Vallarta area require you to take a cab everywhere. Ours is an easy stroll to whatever you desire, except of course for the remote activities such as golf, horse back riding, visiting villages, etc. I and my wife own this beautiful condo. This is not a basic rental condo. This is our home part of the Winter. This is the best location on the best beach in Puerto Vallarta. You can walk to almost everything. This is not a condo furnished merely for rental. This is our home where we live for months every year. It is furnished and decorated for the best in comfort, magical beauty & utility fully, beautifully and comfortably with unique Mexican arts and crafts which we have collected around Mexico through our travels. It will surpass the expectations of even fussy guests. We look directly out over the bay with a mountain background and palm tree frame of the view. We can walk to almost everything: many of Puerto Valarta's best restaurants, BBQed fish and shrimp on the beach and all in between, shopping from art galleries and designer boutiques to native markets and beach vendors and all in between. Walking the interesting cobblestoned streets and by-ways of the Romantic Zone and the Quale River island. Walk out the back door through the pool deck area right onto the beach. Magnificent view of the bay and the mountains framed by swaying palms . The sunsets are amazing. See our photos looking to the sea framed with palm trees with mountains in the background. Beverly and I are so happy that you appreciate our home as we do. We have put a lot of love and effort into it. Great location with a great balcony! Casa Beverly was everything we were expecting and more. The location cannot be beat. In the heart of the Romantic Zone right on the beach. Walking distance to all the bars, restaurants and shopping one can handle. Friendly staff. Great pool. Great shower. Fully equipped kitchen. Decorated with beautiful Mexican artwork. The owners go out of their way to make sure all of your questions and concerns are addressed. They also provide a guidebook of sorts with excursion recommendations as well as reviews of many of the local restaurants. The sunset views from the cozy plant filled balcony is priceless. Always felt safe and secure. For a couple or single traveler the condominium cannot be beat. Charming, comfortable and centrally located. As good as advertised. Ideal for a couple. Clean, well-maintained. Excellent Zona Romantica location steps from the Malecon (beach), shops, restaurants, taxis, local buses. Everything in the unit supported our stay: having the kitchen, the comfortable bed, nice living room and the terrace. Quite a nice shower, too. Plus the crafts around the unit add color and flavor. Owner provides very complete apartment and restaurant info which makes life easy. Thank you for the very nice review. Beverly and I are grateful when someone appreciates the effort and love we have put into our Puerto Vallarta home. If I could give this condo a 10 out of 5, I would! The location and the condo itself are outstanding. Casa de Beverly is right on the beach. You, literally, walk right out the private back gate of the condo and your toes are in the sand! My husband and I stayed for 2 weeks here and, we can safely say, this was one of the most relaxing vacations we have experienced. This was primarily due to the condo, its location, its friendly staff and the outstanding customer service of the condo owner. The condo is centrally located so anything you need whether its groceries, souvenirs, restaurants, bars, etc. is either within walking distance or a short, cheap cap ride away. Additionally, the location of the condo on the beach was OUTSTANDING. Not only are there reserved umbrellas for the condo residents and their guests there is also a parasailing company that operates nearby and, due to their business, they end up keeping the beach clear of anyone else. So, from the reserved umbrellas, there is always a clear view of the beautiful ocean water. I must admit, selfishly, I would like to give this condo a poor rating in order to keep it a hidden gem but it truly is an exceptional place to stay during your Puerto Vallarta vacation. Thanks for the very nice review. Beverly and I put much love and effort into making our home beautiful, comfortable and welcoming to our guests. It is wonderful to be so appreciated. If you are looking for a beachfront romantic getaway in Old Town, do not pass this jewel up! Location, location, location. Cass Beverly is a truly authentic mexican experience. It's location is perfect. You can walk to pretty much everywhere you might want to go. Great access to all the restaurants, etc. From the decorations to the outstanding view. The condo had everything you might need and more. It was great to sit on the balcony snd listen to music coming from local restaurants and just people watch. The pool area was very nice as well and the cleanliness of the complex was superb. We will definitely return. You can visit remote primitive Indian villages, idyllic beaches with few non-Mexicans, a hillside village only reachable by boat with a wonderful beach and quaint village life where families get around on horseback, a Spanish Colonial Era silver-mining town which was at its height in the 18th & 19th century. ocean-side drives rivaling those of Big Sur in California, and so much more.